The Canon G9 camera is a 12.1 megapixel camera with RAW, full manual controls, 35-210mm lens, hot shoe and very good sensor. The Canon G9 gives excellent results underwater especially when used with macro or wide-angle wet lenses and 1 or 2 strobes. The Canon WP-DC21 underwater housing is produced by Canon. Lightweight and inexpensive, it is well known for accepting stacked INON Macro Lenses. 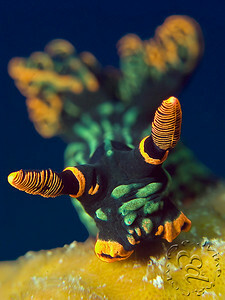 Nudibranch showing rhinophores. Taken by Edvin Eng with a Canon G9 camera, Canon housing, Inon Z240 strobe and stacked Inon UCL165 macro lenses. 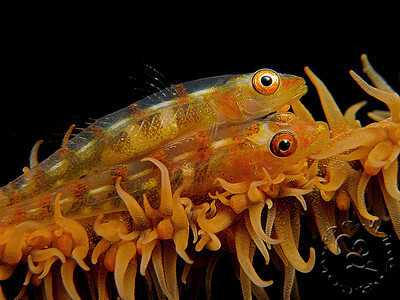 Two gobies, photo by Edvin Eng, with stacked UCL165 macro lenses. 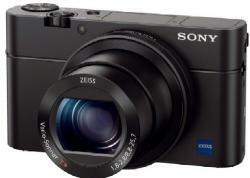 Because of the long zoom lens on this camera, and the long canon port, there are not any good wide-angle options. 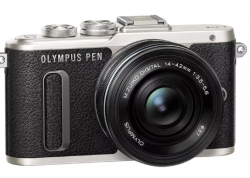 I've read about some people trying a Dyron wide-angle lens, and other people have purchased an adapter that allows 67mm threaded lenses, but you'll have to zoom in and don't expect great results. Try searching for "Eyedapter G9". The Ikelite housing has a reputation for being larger than the OEM housing, sturdier, and more expensive. When used with the optional Ikelite short port, an Inon UWL-100 lens can be used to give pretty good wide angle results underwater, when combined with a dome port. The regular port can take 67mm threaded macro lenses. Also, the Ikelite housing comes equipped with built-in TTL, which can be used in all camera modes except for manual mode. Submitted by Daniel Homem (not verified) on Tue, 2012-02-07 01:56. I have a canon G9 with ikelite housing and 2 DS151 strobes. I would like to buy a macro wet lens for my housing but I cannot figure out exactly if I need an adapter or not. As well I would like to ask your suggestion for a good wet lens that can be used with my housing and where can I buy it online in US. Submitted by Loren Kearney (not verified) on Thu, 2010-04-01 14:54. I too have a Canon G-9, in an Ikelite housing, with Ikelite DS-160 & DS-51 substrobes. 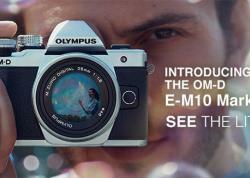 I've attached an Epoque DML-2 macro lens and have achieved amazing results. I've purchased the Ikelite W-20 wide angle lens, but have had some blurring issues. Hopefully the short port Ikelite (#9305.92) makes will clear things up. Great and informative article. Submitted by Robert S (not verified) on Tue, 2011-10-25 17:38. I too have a Canon G-9, in an Ikelite housing, with one Ikelite 125 substrobe. I found this camera (plus rig) very very difficult to operate. The weight of the combined package is too much! Even with the foam "floaty" blocks attached the camera rig feels like a boat anchor. The camera, when zooming hits the front of the Ikelite housing causing an "auto" turn off of the camera .... this is an old problem that is well documented. I too found that many many images come out blurry .... need too long of time for the camera's internal Auto Focus to work. I have had a horrible time with the camera's white balance adjustment for UW images. Thank God this camera is not in production anymore .... at best this is a learning experience for me! Submitted by Robert S (not verified) on Tue, 2011-10-25 17:36. Submitted by steve murvine (not verified) on Mon, 2011-05-30 08:29.
i have the Fantasea w/a lens for my G-9 in an Ike housing . i put the camera in macto mode to shoot w/a and no longer have blurring issues . Submitted by Anonymous (not verified) on Thu, 2011-04-07 12:43.
hi - did the short port help with the wide angle? Submitted by scottg on Fri, 2010-04-02 08:07. Submitted by Caroline (not verified) on Tue, 2010-02-16 14:37. Scott, I just love your website. If your 'hit' rate has gone up in the last few days, it is probably me. I currently have the Canon G9 in the Canon housing and want to get the INON UCL 165 macro lens but I am struggling to work out what adapter I need to go with it as the canon housing does not have a screw ring and is an odd shape, able to assist? Submitted by scottg on Tue, 2010-02-16 15:57.